*San Francisco is a catch-and-release area. Please don't take our ghosts home with you. 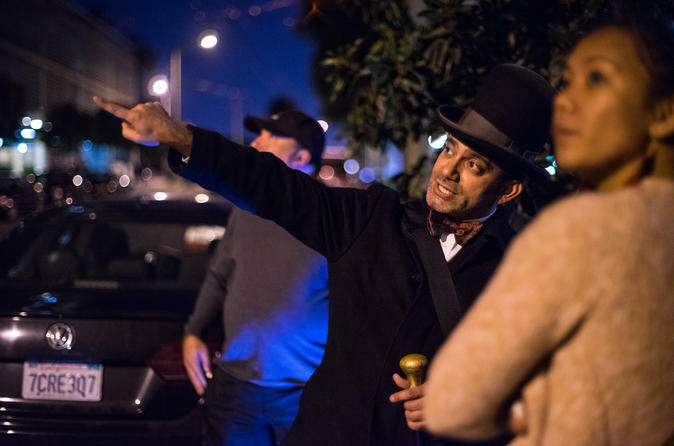 The San Francisco Ghost Hunt is a lantern-lit stroll through Pacific Heights led by Christian Cagigal, magician, storyteller, and expert in haunted history. You'll walk a mile on tree-lined streets in a safe residential area with fine Victorian architecture. There is one moderate hill, the pace is easy, and the views are spectacular. You'll enjoy 90 minutes to 2 hours of guaranteed unearthly fun! The poltergeists at the Chamber's mansion. The millionaire's son who came home dead in a barrel of rum. The bride who haunts California Street. The mysterious woman who led the Underground Railroad to San Francisco. The San Francisco Ghost Hunt is a lantern-lit evening stroll through Pacific Heights, a short ride away from the noise and bustle of Fisherman's Wharf and Union Square. You'll walk a mile on tree-lined streets in a safe residential area with original Victorian architecture. There is one moderate hill, the pace is easy, and the views are spectacular. You'll enjoy 90 minutes to 2 hours of guaranteed unearthly fun! The San Francisco Ghost Hunt starts and ends in front of 1801 Bush Street, on the corner of the Bush and Octavia, among the historic eucalyptus trees planted by one of our heroines. No bathroom breaks. Our evenings can get very cold, especially in the summer. Please dress warmly for this chilling supernatural adventure!